~ All Things Topical and Political. As a political consultant and Senate staffer, I have worked for a lot of office holders and candidates who were strong advocates of hunting and the Second Amendment. For many years, I worked a lot in the West and in rural districts. I cut my share of ads with candidates out in the prairies or the mountains with their guns and dogs. I have also done ads for the Humane Society of the United States that excoriated practices such as bear-baiting, canned hunts, and trophy hunting, as well as ads on animal cruelty. The defense of hunters was always used by the National Rifle Association as a cornerstone of their programs. They pushed gun safety and the proper care and use of guns; they conducted camps and taught people how to shoot. But as their power and finances grew, a lot changed. More and more, we were urged to get guns to “protect ourselves” or to become a collector. Guns for guns’ sake. The technology got more and more sophisticated. Weapons could shoot more rapid-fire bullets and the bullets became more lethal. Cop killer bullets, some were called. The NRA raised more and more money to attack politicians who argued for reasonable checks at gun shows or opposed carrying concealed weapons into schools or churches or community centers. You were either with them all the way or against them—no middle ground. For the NRA, it became about expansion of gun sales and ammunition sales. Why were 300 million guns not enough? Why do we need assault rifles that can penetrate body armor? Why do we need to lift the restrictions on where guns can be carried? 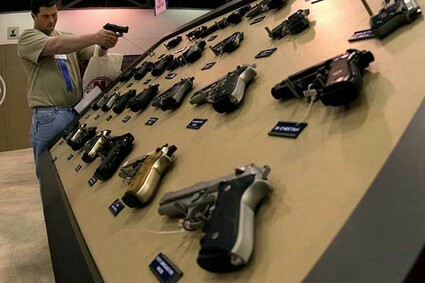 Last year, according to the Washington Post, gun sales topped $12 billion. The gun manufacturers collected nearly a billion in profit. There were nearly 6 million guns bought last year. Six million. This isn’t about hunting. This isn’t even about protection. This is about money. [The NRA answers to the gun manufacturers, the ammunition makers, but rarely to their members. I don’t think we will see much at Friday’s NRA press conference: words about kids and families, some minor bromides thrown out. But they are the problem. I have had it with groups like the NRA who must take a large share of the blame for the culture of violence that engulfs our country. More and better weapons are leading to larger and more devastating slaughters, more murders on our streets, more domestic arguments that turn deadly. Yes, guns kill people. More and more frequently we see their devastation. More and more we see lives and communities ruined. It is time to tell the money-men behind these weapons of mass destruction that enough is enough. It is time we became a civilized nation. It is time to take on the NRA and the gun manufacturers. And, maybe, just maybe, it is time for them to admit the truth and do something about it. - all things topical and political. We look forward to your comments and perspectives on the issues of the day. We will post Peter’s blogs placed on The Hill, USNews, his Tweets, recommendations of other posts as well as some videos from his regular appearances. To receive updates, enter your email and click below.